I rise today to honor the brave men and women of the Spring Fire Department. For 65 years, Spring firefighters have run in where we run out. On April 29, 1953, seven people bound together with donated fire apparatus to form the Spring Volunteer Fire Department approximately 22 miles north of downtown Houston. Local residents and businesses made donations to fund the department for its first three decades. As the department celebrated its 30th anniversary, the volunteers worked to form the Harris County Rural Fire Prevention District No. 1 (HCRFPD). For the first time, the Spring Volunteer Fire Department began receiving tax dollars to help build fire stations, buy equipment and train volunteers. On Texas Independence Day in 1985, the Spring Fire Department suffered its only lineof-duty loss. District Chief Michael F. West died battling a 2-Alarm fire near Old Town Spring. His sacrifice is immortalized in bronze in front of the Spring Fire Department Administration building. As the population grew, the Spring Fire Department continued to evolve. During the 1990’s, as Emergency Services Districts (ESD) began forming to provide stable funding for emergency services in the unincorporated areas of Texas counties, Harris County ESD No. 7 replaced the outdated HCRFPD No. 1. In 1997, the Spring Volunteer Fire Department hired its first part-time firefighters to staff an apparatus during business hours. Widely known as the duty crew, they responded to calls during the day when most volunteers were at work. As the population and staffing needs continued to grow, the department further evolved. In 2013, the department’s first fulltime firefighters joined the Spring fire family. With a combination of fulltime, part-time, and volunteer firefighters, the decision was made to change the name to the Spring Fire Department (SFD). 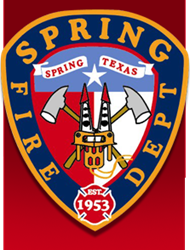 Operating 24 hours a day, 7 days a week, 365 days a year, today the Spring Fire Department is one of the largest combination departments in the state of Texas. SFD covers 62 square miles of northern Harris County serving an estimated population of 152,000 people. SFD’s nine fire stations house a fleet of 25 pieces of fire and rescue apparatus along with 15 support vehicles. The Spring Fire Department is under the leadership of Fire Chief Scott Seifert and today we celebrate their 65 years of dedicated service to the Spring community.